Duchess Kate then travelled to the UNICEF supply centre with Princess Mary while Prince William and Prince Frederik arrived in a separate car. The royals then heard about life for children affected by the crisis and helped pack supplies getting ready for delivery. You can watch the video Here. The royals also met UNICEF ambassador and former James Bond actor Roger Moore. Princess Mary and Duchess Kate reportedly got on like 'a house on fire'. While it wasn't a social occasion Denmark's future Queen welcome Kate with open arms and the pair seem very fond of each other. They are two of the worlds most loved, down to earth royals and I do hope we see more of them together in the future. "Sharp tailoring lends itself to a flattering silhouette with the Ami coat. 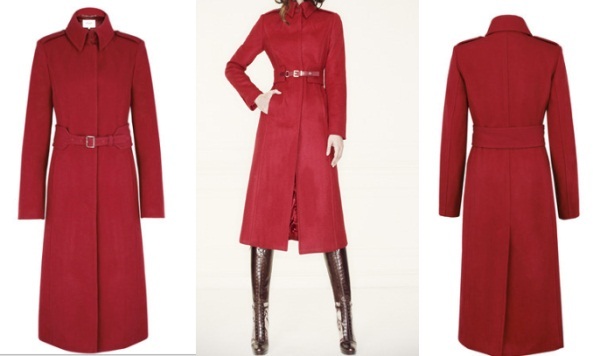 Made in a rich wool mix, this belted coat has a striking collar and is fully lined". The Duchess has always been a fan of suede boots, She gets quite a lot of criticism for wearing them but I think they suit her and are the perfect footwear for the winter. Today, Kate wore Stuart Weitzman Zipkin black suede boots. 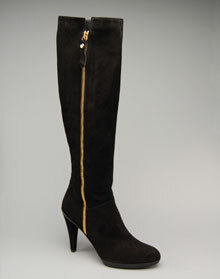 The four inch boots with a gold zipper are available for $635. Kate's accessories were stunning today. 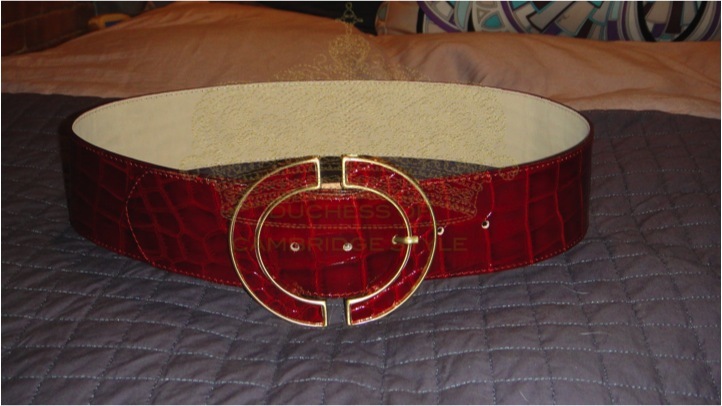 She wore the charm bracelet Camilla reportedly gave her as a present. The disc charm has 'Catherine's' monogram on one side and Camilla's on the other. 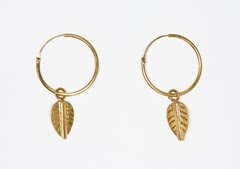 "These are a wonderful pair of earrings which we find never go out of fashion. They are easy to wear both day and night. Comfortable to keep in the ears". William and Kate made a private donation via their foundation to the east Africa crisis. However millions of children still need life saving assistance as the drought continues. I have been researching the work UNICEF do and it is truly inspiring. Sadly UNICEF face a $40 million shortfall and require donations to help the thirteen million people facing famine in east Africa. William and Kate hope their visit raises awareness and gains support for this essential, life saving work. You can donate Here. "It's really just how shocking the situation still is.I think it was initially a very big story . A lot of people did hear about it, but I think because it has been going on, people have perhaps lost track of the terrible situation. So I think this, hopefully, will put the light back on this crisis". Your blog is the BEST!!! This is the only place I have seen these pics. I googled and could not even find them. I will keep checking for updates throughout the day. There is a wonderful number of Kate bloggers. Better photos coming very soon! she is divine!! so, so beautiful. Thanks for posting! Looking forward to seeing what she wears next thursday! I have to agree with Rachel, your blog is the best and you are a very kind girl! Oh, my god, her hair is just amazing! But this outfit is not one of my favourites! Have a nice day and thanks for sharing this with us! Ana B., Thank you sincerely for your kind comment and your participation on the blog. I love Kate's hair too, it's amazing. I agree with others, this blog is the best! So much informations and pics are here. Thank you so much Martina, you are all too kind. Duchess Kate has wonderful followers. I love Catherine and love the outfit she wore but to be honest I think she's overdressed for a charity occasion. Her outfit will be perfect for attending a christmas concert or some event like that. Love your blog! You have complete coverage of all things Kate....I'm an American, and admit I'm obsessed over the style, grace and beauty of the new Duchess! Bekah - It's a stunning coat, I wouldn't be surprised if they reissue it, If they do I will let you all know via the blog.